SCA Name: Kumagaya Kentarou Masamoto, but most folks just call me Kuma. 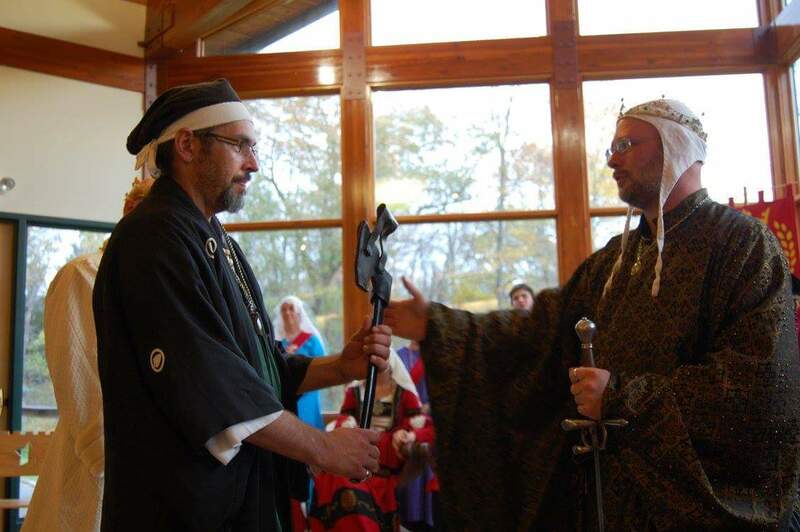 My first official event was Pennsic 44, but I had briefly visited the Baronial Investiture of Liam and Constance in BMDL a few years earlier, which is how I got interested. I’ve been a martial artist most of my life, so the exposure was already there, and I’ve always loved the spiritual and honor-bound aspects of that society. I am an original member of House of Blue Crane, which is a sub-household of Clan Yama Kaminari. I’m a loving partner and father to Sile inghean Chein, mka Desiree Mansir, and our children, Regan, Nicholas, Jazmine, and Killian. I have done much. Heavy Fighting, Fencing, Archery, A&S, Heralding, Equestrian, but I am best known for Thrown Weapons. 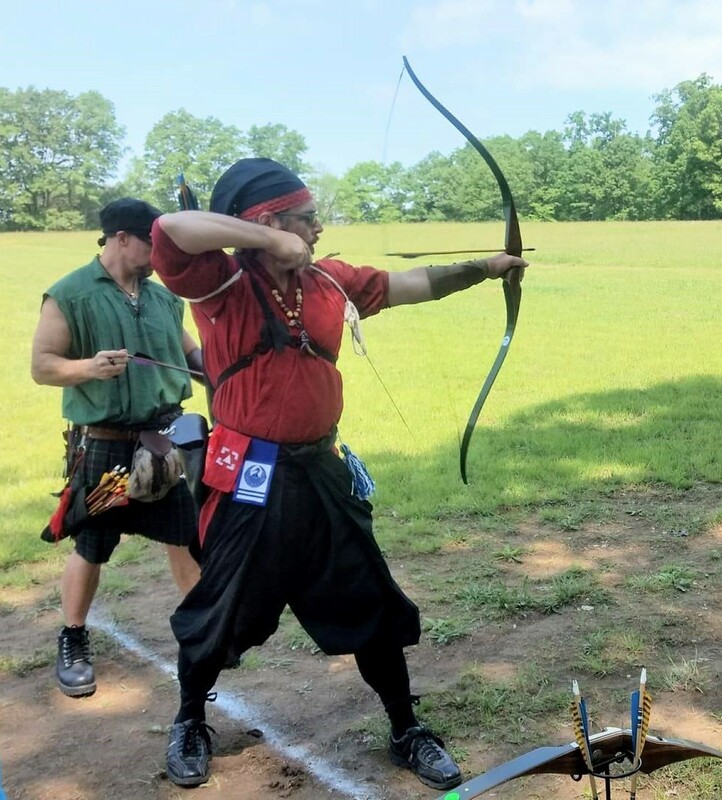 I’ve been Baronial Equestrian Champion and Thrown Weapons Champion, Won the Known World Baronial Champions Tourney at Pennsic 46, and Thrown on the Champions Team the last 3 years. 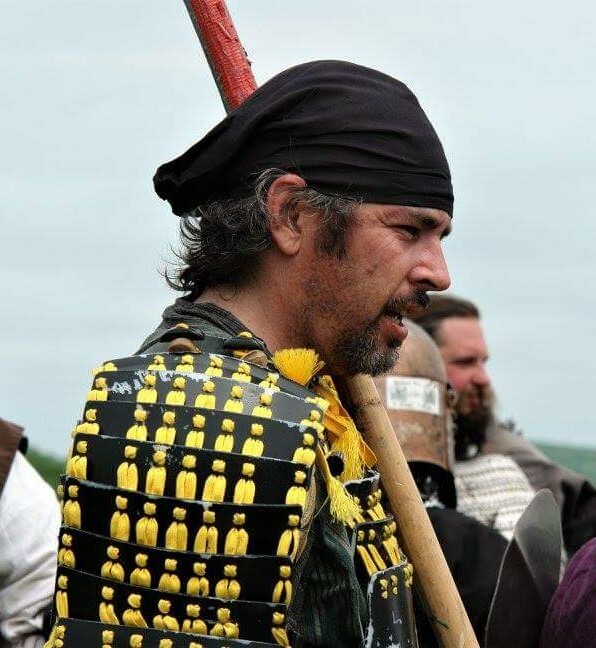 I am Thrown Weapons Marshal in Charge for the BMDL, which includes running weekly practices, teaching throwers, managing the loaner gear and supplies for the range, and coordinating the range for different events. I am protégé to Kamishima Gentarou Umaki, Shark Herald Extraordinary, Order of the Pelican, Head and founder of the House of Blue Crane. 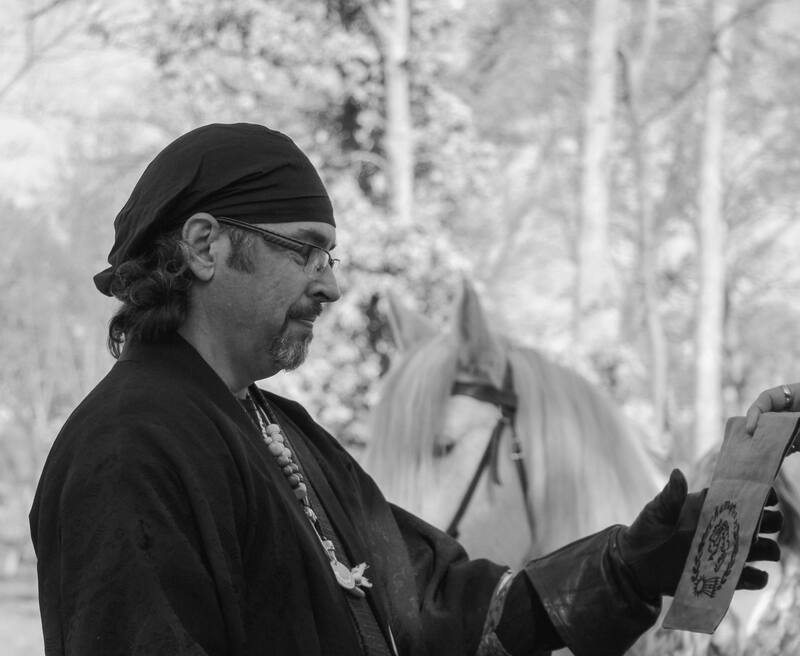 I’ve also performed the duties of Queens Guard, Captain of the Gate Guard for the Kingdom encampment at Pennsic, retainer and guard at the Baronial level, and various other service related endeavors. My goal when I started was to learn. Learn all that I could, about as much as I could handle. Sometimes a little more than I could handle. To try as many things as interested me. To have a blast doing it. I didn’t really know what I wanted when I started, I just knew that it looked really cool and that the people I was meeting were really nice and interested in helping me anyway they could. Many of those people have become lifelong friends and family to me. So I guess you could say that my goal was to immerse myself into the society and see where it went. Mission accomplished to this point, I would say. That’s a tricky question, and not easily answered. I don’t do this for the prize at the end, or for the carrots along the way. So material rewards don’t really register as goals. I suppose that what I really want is to be the best I can be at the activities I’ve chosen to do. Finding time to be that at all of them is sometimes problematic. The only other goal I have is to pass on the lessons I’ve learned and the passion I’ve acquired to every person I encounter. To make their experience as good as I can make it, so that they in turn might do the same for others. To hold the Kingdom and Baronial Championships at the same time. I know that’s technically two things, but I consider it one accomplishment. Do the things. ALL the things. Find what you like, and do it. But don’t overwhelm yourself, and by the same token, don’t limit yourself. Make this experience what you want it to be. And ask lots of questions. Illumination of scrolls, hands down. I can do calligraphy a little, but the painting I have no or very little talent for, imho. Honestly, the Honor I would like the most doesn’t exist yet. I would love to be recognized as a peer for my throwing prowess, and for my service to the throwing community. All the other things I do for fun and for the challenge, but throwing is the one thing that bit me hardest, and the one I take the most seriously. So barring that, I think I would be cool to be elected as Baron of the BMDL. To win an election by the vote of the people who know you the best, or at least the most, would be very humbling and gratifying. Of course my Lady would have to agree to that first. I would be no kind of Baron without her as my Baroness. Thank you for reading this and taking an interest in these interviews. I am honored to be a part of it. If I were to say anything to those reading now, I would say this: This hobby we have is just that, a hobby. However, the relationships we forge inside its web are life lasting and even life changing. I met my Lady on an atlatl range at an event in Sylvan Glen, which neither of us had planned to attend, but just happened to decide to go that day. I have friends across all walks of life through this society. I’ve grown so much because of it. I would want everyone reading this to be reminded that this is YOUR society. Make it your own. Do the things. Make friends. Have fun. Be the person you always wanted to be but couldn’t. And if our paths happen to cross in the future, may the gods shine upon the meeting. See you out there.